A stable and versatile way to support your Dremel tool. 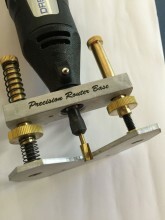 This precision router base is the best way to hold a Dremel for freehand routing, inlaying, widening fret slots, and more. Made of brass, aluminum and machined steel, it features precision cutting depth adjustment with large thumbwheels to eliminate guesswork. Simply unscrew the threaded plastic collar on the nose of the Dremel, and screw on the Precision Router Base. Click the button below to add the Precision Router Base For Dremel Tool - Freehand Routing, Inlaying, Luthier Tool to your wish list.